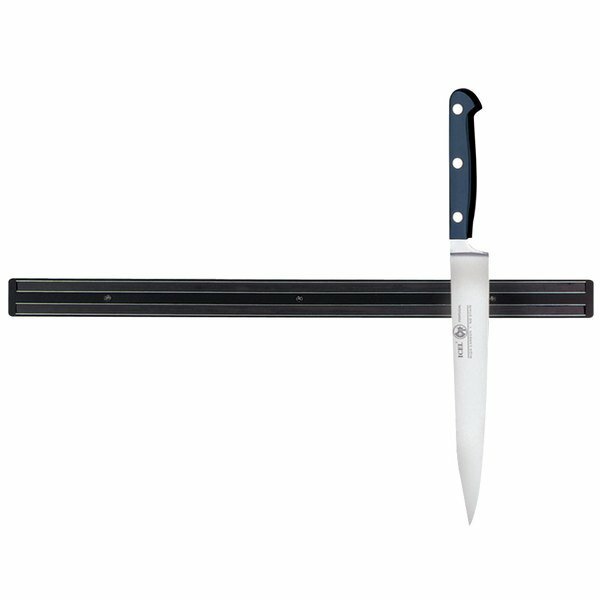 Forget using traditional knife blocks and try this Tablecraft 2918P 18" black magnetic knife holder instead! A magnetic knife holder allows you to simply place cutlery and other utensils against it to securely hold them in place until needed. This open design is a more sanitary alternative to a sheath or knife block which contain small crevices that are hard to clean and can harbor harmful bacteria. Not only is this magnetic knife holder a sanitary choice, it is also a highly efficient space-saving solution that allows you to take advantage of unused wall space! It effectively displays your knives in plain view while also keeping them out of the way to help maintain a safe and organized kitchen. For added versatility, this knife holder includes removable hanging hooks that accommodate non-magnetic items to deliver even greater storage potential and virtually unlimited usage options. You can hang ladles, spoons, and spatulas to keep your most useful tools close at hand and easy to find, eliminating time wasted on searching for your favorite utensil. All of the necessary mounting hardware is included so that you can start enhancing your kitchen's organization right away! Our kitchen is small so we need to find products to help staff but not get in the way. This knife holder can be tucked away in small areas. Awesome. This knife strip comes with all of the mounting equipment you'll need. The hooks that it come with are a nice bonus. We hang scissors and a sharpening steel on the hooks. A must have for any kitchen . Keeps blades from getting nicked up , and magnet is supper strong . I have a large chinese style meat clever hanging on it and it is not going to fall off. In our small kitchen, there is no space for a knife block. This magnetic strip is perfect for storing knives while still being easy access. This is an essential organizing tool for any small kitchen, keeps all of our cutley organized, visible & convenient to grab. We'll be purchasing another soon to accomaodate our growing knife collection. Love these magnetic knife strips, we purchases two for the restaurant. One for the kitchen line and another for our prep room. They hold all of our knives and even some of the heavier duty items. I'm so glad I purchased this knife rack. Not only are your knives kept nice and tidy but convenient when your in a hurry. No more digging through a bin. Love the addition of the hooks to this rack! We can hang scissors and other utensils which makes everything accessible and convenient. Also, we use this to hold our measuring cups and spoons as well - they stick to the magnets just as well as knives! This is a good, utilitarian magnetic knife rack. If you don't need anything fancy, this will hold a lot of knives safely within your reach. Fits plenty of knifes. It is also very strong. We keep plenty of stuff on this and not once has something fallen off on it's own. We've always wanted one of these for the shop, but found them to be too expensive... At this price we're going to order an other one soon, and this one is starting to run out of space. These are great. Exactly as expected. Purchased one for home use and one for second knife rack in restaurant kitchen. Would purchase again if needed. I ordered this recently and hung it where a smaller knife holder was. It came with all the necessary hardware for installing and I installed it within a couple of minutes. It is very sturdy and holds a lot of knives. The one I received has 5 hooks on the bottom as you can see in the picture. Not sure that I will use them, but they are there if I need them. I am not so sure I received the item I ordered as the description for this one does not mention the hooks, but there is another 18" one that does. Either way, for the money you can't beat it. I've seen them elsewhere for double this price. I love this knife holder I mounted it on the side of the refrigerator with magnets and hot glue do not use the mounting screws on the refrigerator ..It holds all my knifes and it is up high away from wandering hands.. This is a nice strong magnet that can hold as many knifes as you can squeeze in without any worry of them falling off. It's also very easy to install. This magnetic bar works great for knives, planners, spreaders and any other quick reach itme needed in the kitchen made of steel. Easy to mount. This magnetic rack is constantly used in our restaurant kitchen to hold knives. It is a great product with a strong magnet and is easy to clean. This knife rack does exactly what it was designed to do. Will hold 6 of my knives as well as kitchen shears. Be sure the knives are clean when you put them up! This is a great knife mount for the price. It is plenty strong enough for heavy knives and feels very solid. The housing is made of strong plastic unlike the expensive ones made of wood. This is still very attractive and serves it purpose well. It comes with mounting hardware and 4 removable hooks with removable rubber tips great for hanging other utensils or measuring cups and spoons.